New Yorkers are celebrating the second annual NY Craft Week September 11 – 20. During this week, there will be festivals, tours, beer tastings, and dinner specials all through the five boroughs. 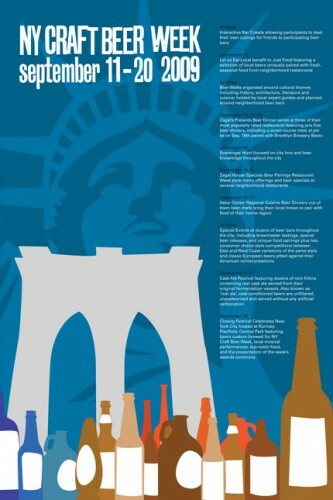 NY Craft Beer Week was created so that others can fully appreciate the quantity and quality of the beers available in New York. It focuses on educating the community and giving patrons the opportunity to gain new favorite breweries and beers. “NY Craft Beer Week showcases the diversity of the city alongside the breadth of the many different beer styles produced by the dozens of breweries that distribute in the city,” Josh Schaffner, NYCBW Founder and Director, said. It all starts with the Gotham Cask Festival, which takes place September 11-13. Three bars will simultaneously tap 60 unique firkins with 20 varieties available at each. Also known as ‘real ale’, cask-conditioned beers are unfiltered, unpasteurized and served without any artificial carbonation. Throughout the week, there will be beer walks where local expert guides will lead tours, built around cultural themes, including history, architecture, literature, cuisine – and key stops for beer. Towards the end of the week, Brooklyn Brewery will have a scavenger hunt on September 19. Teams of four will seek out clues derived from city lore and beer knowledge while enjoying the Brewery’s beer, capped off by a party at the brewery in the Williamsburg section of Brooklyn. “We’re excited about our Scavenger Hunt because it will give friends a chance to reconnect – and to discover some of our newest, inventive brews for the fall,” Brooklyn Brewery’s Brewmaster Garrett Oliver, said. The week will end with “A Walk in the Park at Studio Square,” when Studio Square in Astoria (Queens) will open its Queens Loft and Royal Cellar to the public. The day will include the premiere screening of Beer Quest Episode 1, more than 40 different extremely rare beers, local musical performances, a Greenmarket of local produce, and the NY Craft Beer Week awards’ ceremony.